B&T barrel extension tube and flash-hider. 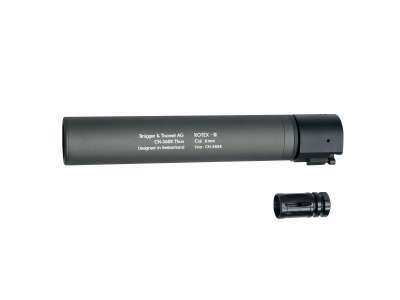 Designed to appear as the ROTEX III silencer made by Brügge & Thomet AG (manufacturers of the famous MP5 a.o. ), but made especially for Airsoft. With superior finish and materials this slimline barrel extension tube features a plunger type lock with a ratchet mechanism for a tight fit on the included flash-hider and is one of the best looking Airsoft “silencers” today. The inner barrel design ensures all shots exits the tube. The plunger lock allows a quick attachment on the flash-hider which features matching grooves and a counter-clockwise 14 mm internal thread, it can easily be screwed onto any barrel that features a matching thread.